Marblehead Rotary club is pleased to welcome Jason Silva as its newest member. 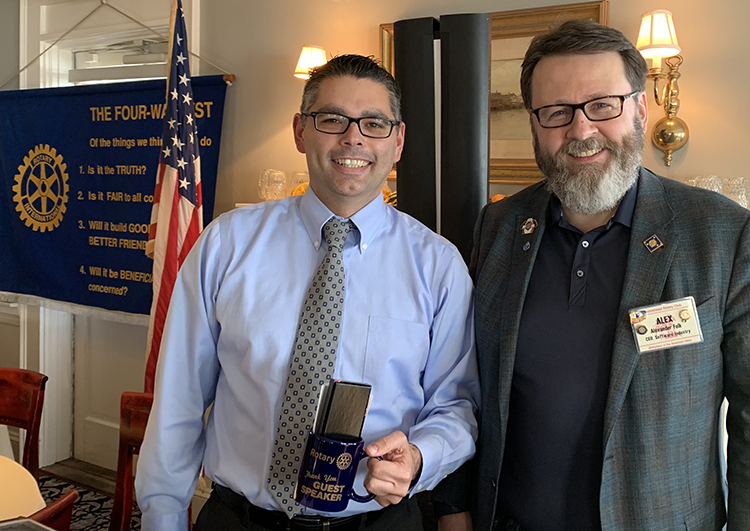 Silva, recently appointed Marblehead Town Administrator, transferred his affiliation with the Salem Rotary Club to the Marblehead Rotary Club. Silva is a firm believer in the mission of Rotary— providing service to others, promoting integrity, and advancing world understanding, goodwill, and peace through its fellowship. Silva, A seasoned professional in the public sector, Jason brings a wealth of experience to the Town of Marblehead. Having worked at the local and state levels of government as well as in the non-profit arena, Jason brings a unique perspective to the complex issues important to communities and the region. Over the course of his career, Silva has worked for the City of Salem as Chief of Staff under the direction of Mayor Kim Driscoll, served as Chief of Staff to State Senator Joan Lovely, and now serves as Town Administrator in Marblehead. Silva has also worked in the not-for-profit sector as an Associate Director at the Massachusetts Nurses Association and as Executive Director of the Salem YMCA, He has also served in an elected capacity as a City Councilor At-Large in the City of Beverly. Silva is a graduate of Salem State University and has recently completed his studies at Suffolk University to achieve a Masters in Public Administration. He also holds a Certificate in Local Government Leadership and Management from the Massachusetts Municipal Association and Suffolk University. Silva is married to Theresa and they have 3 boys Harry (12), Charlie (10) and Archie.